There's something about washing and drying a quilt that makes it even more amazing than before. After I had finished machine quilting this, I was not liking it at all. You see, I used larger needles as was recommended by a Juki expert on yahoo groups. I experienced alot of shredding and thread breakage, even with my new favourite thread, 50wt Aurifil And it made holes in the back of my quilt. Topped with the gray thread, it just looked kind of icky. Even my uneven circles, my wobbly lines were rescued. My doodling curvey filler in between the circles even start to look cool. I'll even let you look close at my crazy filler doodles.... because on the white backing, the entire quilt looks oh so cool. If you are a long armer and reading this, or have your machine on a frame - do not judge my work. I just have fun with it. plain and simple. I placed a small border on it. I was fiddling forever on what to do with borders. I didn't have enough fabric for my first idea. Measures approximately 46 x 56 after washing...please excuse the unevenness of the quilt in this last photo - I realized I hadn't stretched it and shaped it after taking it out of the dryer. In this photo, you cannot see the hint of the contrasting dark binding colour I used...but it's there. It's called Bedford because, well, the colours remind me of Martha Stewart land, and one day, I will have a vegetable garden just like hers so I can stuff myself silly with okra. Pattern is a basic rectangle in rectangle - no pattern used, so if you're interested in measurements, just contact me. The circles are 12" diameter - I cut out a piece of cardboard and marked the circles randomly on the quilt - then I just machine spiralled inwards from the outside edge of the circle. Dense quilting makes it difficult to handsew binding on - get a thimble handy. I find the Konas fray quite a bit. With the white sashing - trim your frayed edges, as when you baste/sandwich, those little buggers show through and then you have to take it apart because it bugs you. when cutting and piecing your whites, make sure you really look carefully that you have all of the same lot of white. White is not all the same. I have two kinds of white on my sashing...if you look carefully in person, one is a creamy white. shhh, don't tell. doodle with continuous line drawings on paper to practice your fillers. I used to do this all over my algebra books in highschool, except I didn't realize it would come in handy 20 years later! when you are doodle filling, try and do this all in one sitting. I did it in two sittings, and found the 2nd time, it took a bit to relearn the doodle pattern groove I was in at the first sitting. holes made from your needle will close up after washing. **at this rate, it's doubtful that I'll meet my "all" konas used goal by the end of the year...but I'll sure have a fun time trying! Backing - a white cotton that I get from the drapery department of my fabric store. It's affordable and a nice weight, and it's super duper wide. Basting/Sandwiching - I spray basted and once again, loved it. I picked this up from Craigslist for a whopping $35.00. I don't have time this week to figure it all out, but for 35.00 I jumped at it. It also came with a box of thread! A lady was downsizing her home and moving into an apartment, and her eyesight couldn't deal with sewing anymore. :( I was pretty excited. Now to find the time to figure it out. No stippling for this girlie. No straight lines. No patterns to trace. I'm doing circles - dense concentric ones and loose lazy ones. And then inbetween - filler doodling. It's my doodling quilt. And there's uneven stitches and circles that are kind of wobbly, but it's fun and kind of therapeutic. I'm not a perfectionist - I really enjoy process and the journey of learning something. Here's what I've learned so far - when you are quilting a large pattern, don't worry about where you are, worry about where you are going in about 6 inches from now, that will give you smooth lines. Kind of a life lesson too - don't worry about what you're doing now...but where you are going.... deep huh? after just emailing the other day it's previous owner and saying how much i loved it.... suki had a big tantrum today, and then of course i did too. I find it very picky...like everything has to be just 'so' for it to work nice. I love it's speed, I love the thread cutter. That's it for today. Hopefully tomorrow we will get along again, and the stars will be aligned just perfectly. A glass of wine is in order. It took me 3 hours to sew two borders today. So, I'm not sure if I said that I joined two bees. Hey! I joined two quilting bees on flickr! Wasn't sure if I would, but then last month, decided to. I'm liking it so far. It's fun to make a single block and learn a technique without having the daunting task of an entire quilt. If you haven't done one, try it out! This one required whirlygigs...what a fun and easy block! Don't look too closely at my work. 1. I've never ever done a triangle block before, I'm a square girl. 2. I've never made a pinwheel before. So, here's what I noticed when making a triangle block. I think it's called an HST (half square triangle) After I draw the diagonal line on my square, I need to stitch 1/4" on either side of that line. My quilting foot didn't like that (it has that fabric guide which wants to bunch up any fabric on the right of the foot) and I had to change presser feet and use the little guide line on my sewing plate. This was difficult because the fabric of the square was covering the plate markings so I really had to guesstimate. So then I was thinking... what colour do you avoid because it's dated or ugly or too hard to 'go' with other colours? My challenge is going to be transforming the unpopular colours and trying to combine them to make them a contemporary style quilt - make them in vogue again. I'd love to hear what your colour fear or avoidance is! So, um this is me! 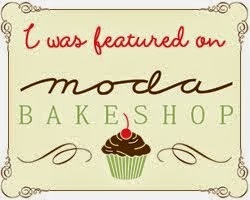 I somehow snuck my way onto the Moda Bake Shop and did a project. For the last 2 weeks since my project has been completed I have been losing sleep and having nightmares. Seriously. (dreams like....I received 3 comments total about my project and they were all negative. My instructions were garbled and formatting was all over the place and the font was some kind of weirdness too) The worst one for me was no comments. So go. Just comment and make me feel better. The quilt is already in use and is getting fought over on a daily basis. Need to make another one. That snuggles fabric is gorgeous. All you want to do is pet it. And I want all of the polka dots from the Freebird by Momo.